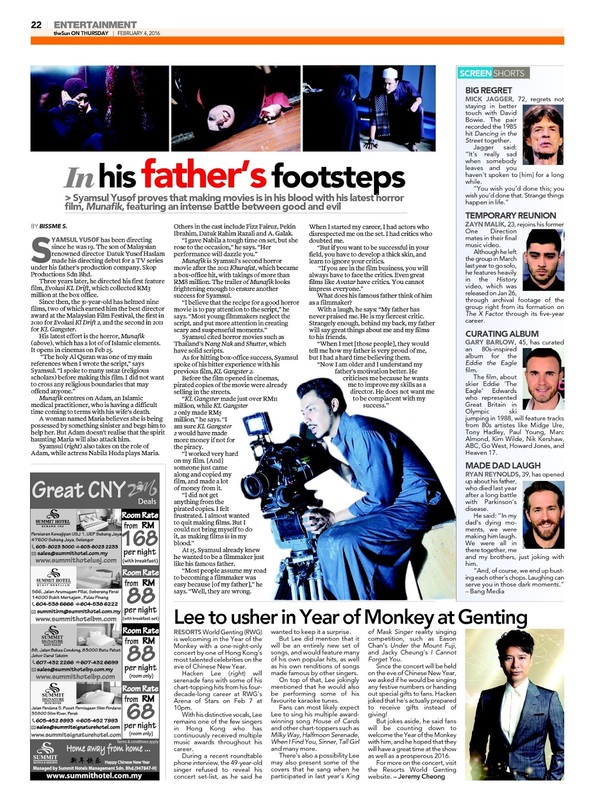 Film maker Syamsul Yusof speaks to the Sun about his latest horror movie Munafik. Here is the full story. Syamsul Yusof has been directing since he was 19. The son of Malaysian renowned director Datuk Yusof Haslam made his directing debut for a TV series under his father’s production company, Skop Productions Sdn Bhd. Three years later, he directed his first feature film, Evolusi KL Drift, which collected RM3 million at the box office. Since then, the 31-year-old has helmed nine films, two of which earned him the best director award at the Malaysian Film Festival, the first in 2010 for Evolusi Kl Drift 2, and the second in 2011 for KL Gangster. His latest effort is the horror, Munafik (above), which has a lot of of Islamic elements. It opens in cinemas on Feb 25. “The holy Al Quran was one of my main references when I wrote the script,” says Syamsul. Munafik centres on Adam, an Islamic medical practitioner, who is having a difficult time coming to terms with his wife’s death. A woman named Maria believes she is being possessed by something sinister and begs him to help her. But Adam doesn’t realise that the spirit haunting Maria will also attack him. Syamsul also takes on the role of Adam, while actress Nabila Huda plays Maria. Others in the cast include Fizz Fairuz, Pekin Ibrahim, Datuk Rahim Razali and A. Galak. “I gave Nabila a tough time on set, but she rose to the occasion,” he says. Munafik is Syamsul’s second horror movie after the 2012 Khurafat, which became a box-office hit, with takings of more than RM8 million. The trailer of Munafik looks frightening enough to ensure another success for Syamsul. “I believe that the recipe for a good horror movie is to pay attention to the script,” he says. Syamsul cited horror movies such as Thailand’s Nang Nak and Shutter, which have solid scripts. As for hitting box-office success, Syamsul spoke of his bitter experience with his previous film, KL Gangster 2. Before the film opened in cinemas, pirated copies of the movie were already selling in the streets. At 15, Syamsul already knew he wanted to be a filmmaker just like his famous father. “Most people assume my road to becoming a filmmaker was easy because [of my father],” he says. “Well, they are wrong. When I started my career, I had actors who disrespected me on the set. I had critics who doubted me. But if you want to be successful in your field, you have to develop a thick skin, and learn to ignore your critics. What does his famous father think of him as a filmmaker? With a laugh, he says: “My father has never praised me. He is my fiercest critic. Strangely enough, behind my back, my father will say great things about me and my films to his friends. “When I met [those people], they would tell me how my father is very proud of me, but I had a hard time believing them.